The Chapel Choir sings Choral Evensong every Wednesday and Solemn Eucharist every Thursday in the Chapel – here’s the list of music you will hear at these services. It has been five years since the Chapel Choir last performed Bach’s magnificent St Matthew Passion. Scored for double choir, double orchestra, and soloists, this masterwork tells the story of Christ’s Passion using the narrative from the Gospel of St Matthew and additional texts by Bach’s librettist, Picander. The role of the Evangelist will be sung by reknown British tenor Charles Daniels. The chamber orchestra Ensemble Regale is led by Baroque master David Greenberg and includes instrumentalists from Nova Scotia and across Canada. These performances will also feature the boy sopranos of Capella Regalis Men & Boys Choir and a line-up of stellar soloists from Canada’s early music scene. The Chapel Choir’s performances five years ago were named “the East Coast choral event of the season” by CBC Music. The University of King’s College has won a reputation for presenting world-class performances of the great Baroque masterworks right here in Nova Scotia. Tickets $20 / $30 / $45 / $100 PLUS HST, available at www.tickethalifax.com (902.422.6278), the King’s Co-op Bookstore (902.422.1270 ext 261) and at the door. Described by the Chronicle Herald as “annual magic,” this feast of seasonal song and story is back for an 11th year. 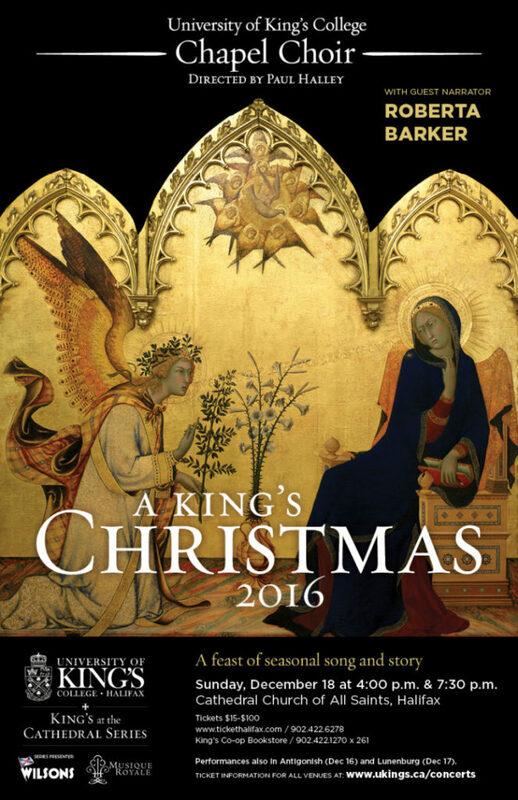 Directed by five-time Grammy winner Paul Halley, the music features a fresh selection of carols each year, from the mediaeval to the modern, sung by the acclaimed University of King’s College Chapel Choir. This year’s guest narrator is beloved radio host Don Connolly. Connolly is known to generations of Nova Scotians as the warm, reassuring voice of CBC’s Information Morning, a programme from which he recently retired after more than four decades. Connolly’s selection of readings is sure to bring a wonderful, local flair to the festivities. Tickets are available in advance at the King’s Bookstore / 902.422.1270 ext 261 and at www.tickethalifax.com. Tickets will also be sold at the door. This annual tribute to those who have gone before and the opening concert of the 2018-19 King’s at the Cathedral concert series will feature the supremely beautiful Requiem by French composer Maurice Duruflé (1948). Duruflé dedicated the work to the memory of his father. He had grown weary of increasingly overblown settings of the Requiem text and decided to return to the original Gregorian chant as his basic thematic material. To the chant he added masterful choral and orchestral arrangements that call to the mind of the listener images of heavenly bliss deftly interwoven with a sense of human pathos and our longing for eternal peace. The Duruflé Requiem will be performed with Ensemble Regale (a hand-picked chamber orchestra) and guest organist Patrick Wedd. For All The Saints will also feature O quam gloriosum est regnum (O how glorious is the kingdom) by the English Renaissance composer William Byrd, a setting of Timete Dominum omnes sancti ejus (Fear the Lord, all ye his saints) by Italian Renaissance composer Ascanio Trombetti, G. P. da Palestrina’s Nunc Dimittis for double choir, 20th-century English composer Benjamin Britten’s Te Deum in C, and contemporary English composer Jonathan Dove’s Into Thy Hands. Based on the overwhelming response to their performances of Monteverdi’s Vespers of 1610, director Paul Halley and the University of King’s College Chapel Choir are turning once more to the Italian composer to present selections from his 1640-41 collection Selva morale e spirituale. 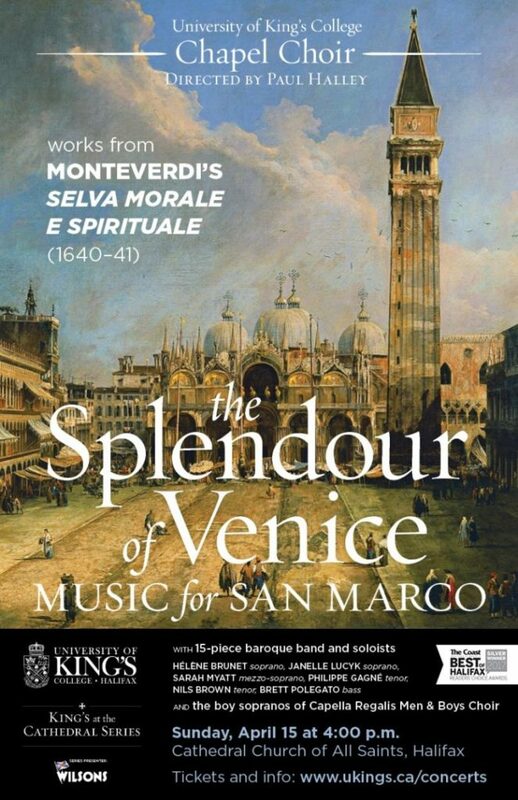 Translated as ‘a moral and spiritual forest’, the Selva is Monteverdi’s retrospective anthology of his sacred compositions, compiled at the end of his 30-year run as maestro di cappella at the Basilica of San Marco in Venice, and not long before his death in 1643. The various pieces, scored for a range of forces from one voice and continuo to triple choir with 12 instrumentalists and continuo, exhibit Monteverdi’s wholly pioneering style in the then-emerging world of Baroque music. 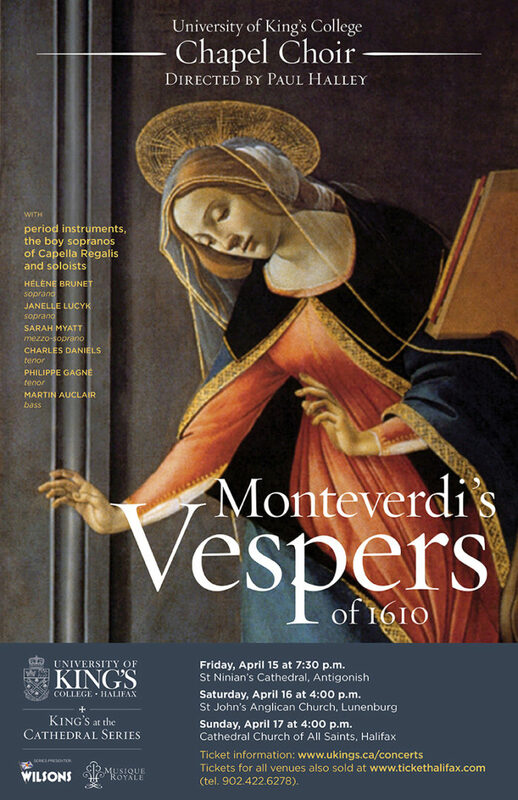 While the Vespers was Monteverdi’s first major liturgical piece, composed just prior to his move to the Basilica of San Marco, the Selva is a stirring culmination of the brilliant musician’s career. Directed by five-time Grammy winner Paul Halley, this performance features the 24 choral scholars of the King’s College Chapel Choir alongside 15 instrumentalists on period instruments, a cast of early music soloists from across Canada, and the boy sopranos of Capella Regalis Men & Boys Choir. Tickets are available for purchase on Ticket Halifax and at the King’s Co-op Bookstore, 902-422-1270 ext. 261. Described by the Chronicle Herald as “annual magic”, this feast of seasonal song and story is celebrating its ten-year anniversary. 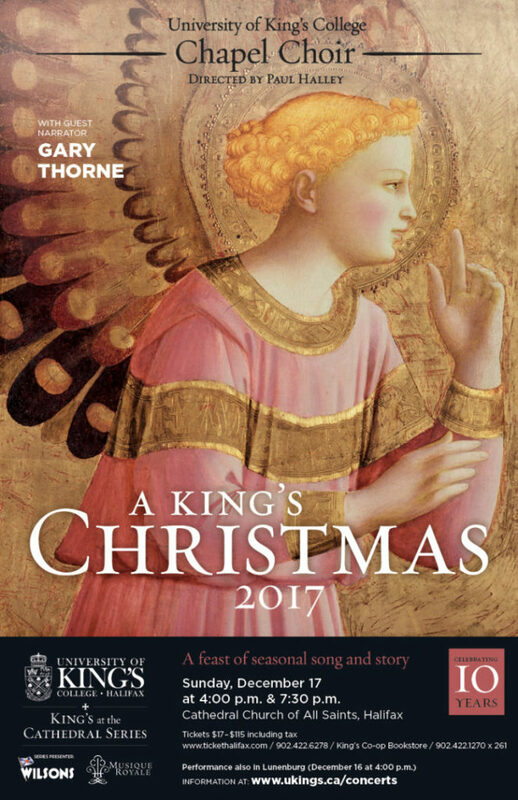 Directed by five-time Grammy winner Paul Halley, the music features carols from the mediaeval to the modern sung by the acclaimed University of King’s College Chapel Choir. The Rev. Dr. Gary Thorne is a priest, theologian, university professor, and activist currently serving in his final year as Chaplain and member of the teaching faculty at the University of King’s College and Dalhousie University. In addition to his work with university students, Fr Thorne has served as a parish priest, a military chaplain on the ground in war-torn areas of the globe, and an advocate for the poor and marginalized. This annual tribute to those who have gone before and the opening concert of the 2017-18 King’s at the Cathedral concert series will feature not one but two pieces, which have a 400-year span in between them. The first is a requiem, the Missa pro defunctis, or Mass for the dead, written by Cristóbal de Morales in about the year 1550. Morales, a Spanish composer born around 1500, was recognized in his lifetime as one of the greatest composers in Europe. His contemporary Juan Bermudo, a friar and music theorist, described Morales as “the light of Spain in music”. Morales’s requiem mass setting is a work of impeccable structure supporting a floating, ethereal beauty, and it may have been his final work. In past All Saints performances, the Chapel Choir has presented the requiem masses of Victoria (1603, performed in 2013) and de la Rue (c. 1500, performed in 2014 as a Canadian premiere of a 500-year-old work). The Chapel Choir therefore continues its study of the earliest polyphonic requiem mass settings with this mid-16th century masterwork out of Spain. In the same concert, the Chapel Choir will complete its performance cycle of the three canonic 20th-century mass settings for unaccompanied choir. Having performed the other two settings (the Mass for Double Choir by Swiss composer Frank Martin performed in 2015 and the Mass in G minor by Vaughan Williams performed in 2016), this year the choir completes the circle with the Mass in G major by Francis Poulenc. 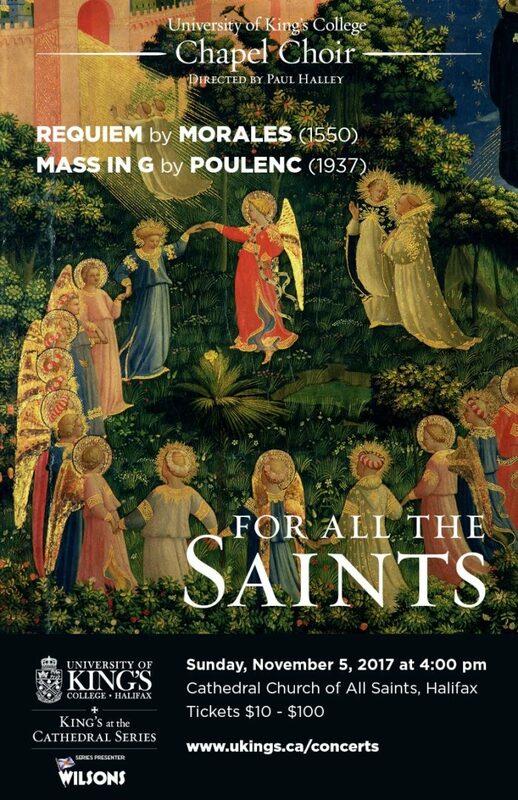 This Mass was Poulenc’s first major liturgical work. It came out of a religious reawakening that the French composer experienced in 1936 following the tragic death of a friend and a visit to the shrine of Rocamadour. 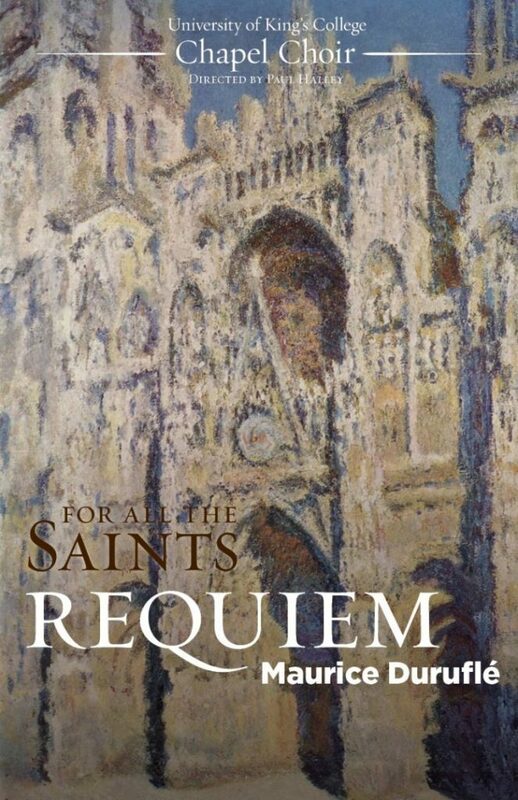 One year after his experience at Rocamadour, Poulenc composed his Mass in G. In setting the ancient text of the Church, Poulenc found his musical and spiritual home and continued to create sacred works of deep and lasting beauty for the rest of his life. 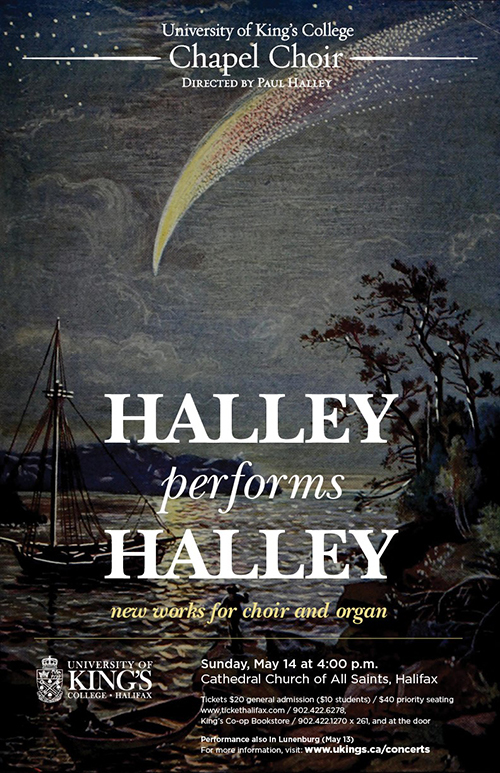 A concert of new works for choir and organ written and directed by five-time Grammy winning composer Paul Halley. These 14 pieces selected from Halley’s extensive output of the last decade are all unfamiliar to Nova Scotian audiences. From wedding anthems written for his children to commissions for choirs across North America, these works set beautiful texts – including psalms, and poems by Tennyson, Neruda, Herbert, Manley Hopkins, and Mechthild of Magdeburg – in striking ways. The King’s College Chapel Choir suspended its cycle of Bach masterworks for one year to present another great pillar of the Baroque repertoire – the Vespers of 1610 by Claudio Monteverdi. A monumental work scored for soloists, choir, and orchestra, the Vespers foreshadowed the religious masterworks of Bach and Handel, and has earned a place in the history of western music as a revolutionary and now iconic work. 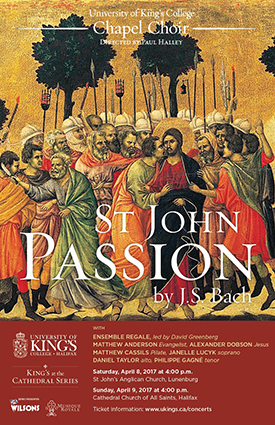 J. S. Bach’s masterful representation of the Passion of Christ according to St John was first performed in Leipzig on Good Friday of 1724. It is a musically extravagant setting full of foreboding and intensity yet startling in its beauty. Five-time Grammy winner Paul Halley directs the acclaimed University of King’s College Chapel Choir, the orchestra Ensemble Regale led by baroque expert David Greenberg, and a wonderful cast of soloists in two performances of the great work. Described by the Chronicle Herald as “annual magic”, A King’s Christmas is back for its ninth year. This feast of seasonal song and story is directed by five-time Grammy winner Paul Halley, and features the University of King’s College Chapel Choir performing a beautiful blend of carols from the medieval to the modern. Roberta Barker is a Professor of Theatre Studies and Associate Director of the Fountain School of Performing Arts in Halifax. Dr Barker brings to these concerts a wealth of expertise in drama and literature with particular focus on the works of regional authors. The University of King’s College Chapel Choir opens its 2016-17 King’s at the Cathedral concert series with a 20th century masterwork, the Mass in G Minor for Double Choir by Ralph Vaughan Williams. Composed in 1921, the piece is full of the rich harmonies associated with the composer in his most ‘English summertime’ moments, but the origins of the piece are also in the revival of English polyphony and with Vaughan Williams’ identification of his music with ‘the imperishable glories of English prose’. The concert will also include works by Byrd, Barber, and Poulenc, and glorious hymns accompanied by the Cathedral’s great pipe organ and the Maritime Brass Quintet. 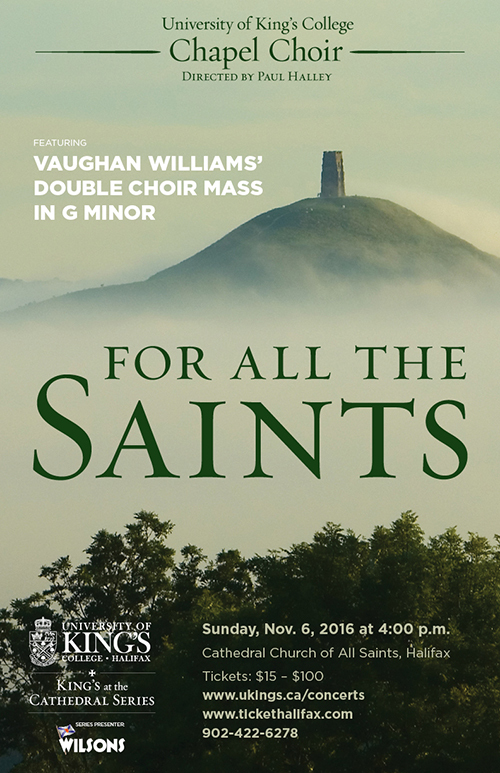 This performance will be the choir’s eighth annual concert celebrating All Saints and All Souls. Featured pieces in the past have been Rachmaninov’s All Night Vigil (1915) and Requiem Mass settings by Duruflé (1947), Fauré (1890), Schnittke (1975), Victoria (1603), and de la Rue (c. 1500). Halley and the University of King’s College Chapel Choir continue to present mass settings that are otherwise rarely, if ever, heard performed live in Nova Scotia. This concert was also presented at The Cathedral of the Immaculate Conception in Saint John, New Brunswick on Friday October 28th at 7:00 p.m.